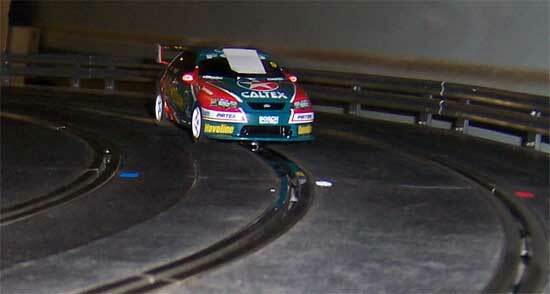 Round nine for the year was an endurance race for Scalextric V8 Supercars. This consisted of 15 minute heats across the four lanes. Not only was it the first time for this class this year but also the first time for a new track. 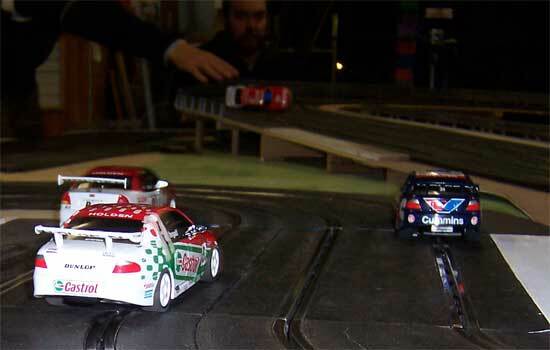 This time we raced on Scalextric classic track with a few SCX pieces thrown in at the Joe's house. It was up to Joes usual high standard well thought out and not requiring as many marshalls as usual which meant some of us could just wander around and chat or put s#!t on each other. Hard to get a full pic of it though. Glenn with the Tander Commodore did a great job on the night. He drove consistently well all night and finished up third overall on the night. Al owned the race taped Ingall car which he had obviously let his son Daniel drive. There were a few of these on the night which either showed that Rusty is not popular as knowone cared about smashing up the car or he has a few supporters. Bo had the Richo VY and drove to his usual 5th place. Same cars and the rolling Ingall in the background. Behind is Greg in the Greg seat. He shared this over the night with Greg 2 who became quite relaxed there at times. Chris did one race with the BA Ingall car and put it away. Need a bit of work those BA Fords. Camerons great looking Skaife Commodore with Patto decals. His and my Ambrose BA Ford equalled each others lack of popularity. 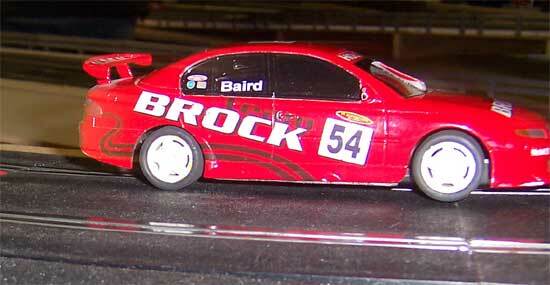 A final pic to show of Devious Daves Team Brock Commodore once again. Then came Greg, Rob, Chris Cameron and Greg 2. I noticed that you got photos of the dreaded double inners, now called R1's in Sport. I was very surprised how well the V8's got through there. I was dreading that spot as too easy to crash and a potential nightmare for an off taking out the field, but it wasn't so bad. The results show how close the pack was, other than Joe and Dave battling each other way out in front. those guys were in a class of their own. For the rest, the difference was just a deslot either by the driver or by another car blocking a lane. Once everyone got into a rhythm, the marshalls had little to do except for the occassional late braking duels. 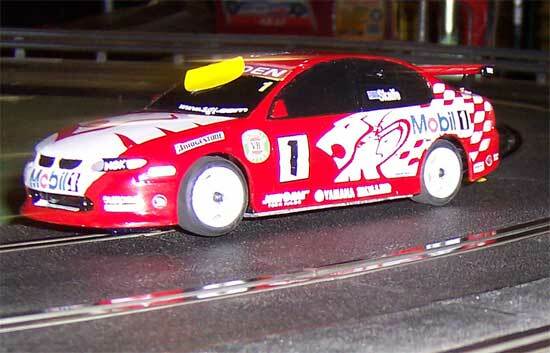 Racing these on a track with squeeze sections will be a hoot And someone asked about racing these as digital.... hmmmmm, that could be very interesting. V8's proved to be a great class and would be a good series for 2006 (he says getting his bid in early for the AGM). We have the V8 host class coming up next too. 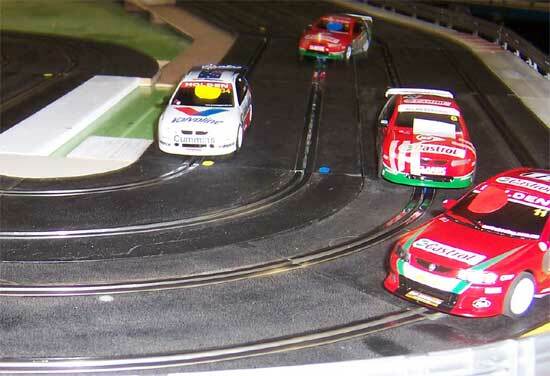 Oh well it is getting to the pointy end of the 1:1 V8 series so the more the merrier. There were a few if onlys there too. If only I had have stuck with my original setup. If only Joe and Dave weren't so quick. The gauntlet is down now and all bets are off for the NC1 Classics which also run next time as well as the Open Sports class. The Ninco track setup is out the window now and setting up for two classes with no practice over the next two weeks will be interesting. Can't find that ace up my sleeve now. 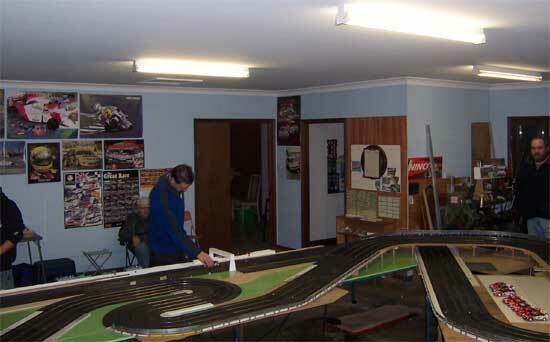 Just wondering what set up for the cars as I race at Luddenham with Steve and we are having a bit of fun with the V8 after we race our Flexi's. Steve: Down here we run them weighted to about 115/125 grams,but our tracks are much shorted than Luddenham I think. These cars are pretty easy to set up. Get your body rocking. Trim the 2 locating tabs off the front of the chassis.Sand the chassis so its clear of the body. File off a little of the thread from the screws so they don't catch the body when it rocks (Vinno has posted photos elsewhere). When you refit the screws, back them off a little at the front and about a turn at the rear. I lowered the body a bit. Sand off some of the body posts, make sure the body doesnt touch the tyres though when rocking. Note that the chassis posts have a lip and sanding these doesn't do a lot (D'oh! it took a while to work that one out). Reinforced the posts with some plastic tubing. Check the ride height of the guide. I sanded the fronts to get the guide nice and deep and have the fronts bearing no weight. Just put the front onto the rear wheels and use sandpaper. I also tapered the profile of the fronts using an emery board after truing, with the added advantage that the car looks like a V8. Replaced rear tyres with Ninco soft racing. Others used Slot.It P2 or P3's. Just a light truing and make sure to round off the edges. Ninco tyres (20x11) are treaded to so I removed the outside tread to help the car to slide smoothly. I keep the rest of the tread while others used slicks. Didn't need to glue the tyres. Trim the guide to suit. 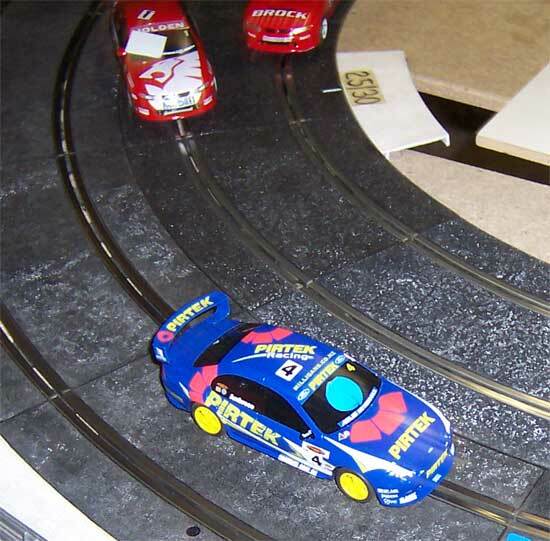 We race on plastic so its fussier than routed. I rounded the front of the guide's leading edge to stop it catching on slot rail joins. I also bevelled the front of the guide flag for the same reason. As a series 1 car, the self centre spring is too strong so I tossed it away. I trim off the sides off the guide leading edge so that it can turn a bit more. Check the contact strip springs were bent down to keep contact wth the guide. Trim the braid so it sits within the notches and doesn't push the braid down,which in turn lifts the guide up. I go so far as to file the braid to get it nice and smooth, then just spread out the end and bend it down a little. Doesn't need much and not enough to lift the guide or car, just enough so it will spring down if the car hits a bump. I found the motor and bearings did not need gluing in place so I didn't. But the bearing/axle fit was sloppy so I oiled the axle then wicked SuperGlue into the bearing and turned the axle until the glue dried. Now its noticeably quieter and smoother. Added weight into the side channels of the chassis and same underneath. Added double strip of lead under rear axle, but may remove this. Added a piece under the chassis just behind the guide. All up 100g, others went up to 120g but then some seemed to have a bit too much grip at the rears and were tippy. When you've got a few weeks free can you detail how you modify your other quick cars too? I have found that after sometime and cleaning the rear tyres they " Grow" and come loose on the wheels. we use WD40 and shellite to clean them. Once this has penetrated the tyre it is harded to glue so if you clean your tyres a lot or work them for routed tracks it is a good idea to glue them on first. I also found that my Lownes Falcon had the motor fitting looser that the other cars and would often come out,i don't know if this is common or not!